Smile Dong Hae finale is expected in the next few days in the Philippines. 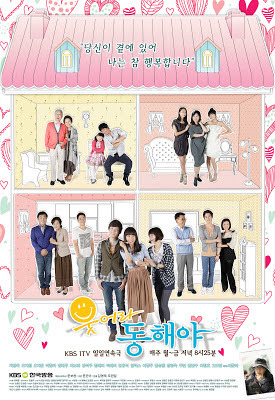 This Korean drama, otherwise called Smile Again, features a 2010 daily drama on KBS 1TV with major 2011 awards under its belt. New Timeslot! After Paroa (Ang Kuwento ni Mariposa) and before 24 Oras! Mom and son Anna and Carl Laker (also called Dong Hae) visits Korea for a speed skating competition where Dong Hae represents the American team. He also wanted to see his girlfriend Sae-wa, whom he had dated for 6 years and intended to marry. But she had a change of heart and did not want him anymore because of his mentally ill mother. Yet he still saved her from being struck by a vehicle. The accident caused an injury which ended his skating career. The mother and son tandem also decided to stay in Korea in search for his father, whom Anna had stumbled upon somewhere in Korea. Luckily, Dong Hae met Bong-yi’s family who took them in and considered them as family. Dong Hae and Bong-yi fell in love despite protests from Yoo-jin and Seon-woo. Anna also finds a new love in Pil-jae, Bong-Yi’s uncle. He is a widower who has a daughter named Song-i whom Anna had eventually grown to love. But to make things more complicated, Dong Hae’s father, who gave the American name “James” on his stay in New York to study, became Sae-wa’s father in law. James met Anna in the U.S. and promised to come back for her but never did despite knowing she was pregnant with his child. Going back to Sae-wa, she had a boyfriend while having an affair with Dong Hae. The boyfriend turned husband is Dong Hae’s own younger brother Do-jin, his father Joon’s son with wife Hye-sook. Additional interconnections include Sae-wa’s younger sister Sae-young who marries Tae-hoon and had twins with him. He is Bong-yi’s older brother. Their parents, Kang-jae and Seon-ok for Bong-yi and Sool-nyeo for Sae-wa are also friends. The climax rises as it turned out that Anna Laker is actually the hotel matriarch and patriarch’s lost child. She was lost during a storm in Jejudu Island during her childhood, with only her dress and picture as keepsake. She was adopted by an American mother, which explains why she grew up in the U.S. Despite a tainted marriage, Sae-wa chose to help her mother in law (the hotel owners adopted daughter) to hide the truth in order to keep the hotel and her status as part of the hotel heir’s family. Joon, however, paved the way towards the revelation of the truth. What I love about this Korean drama is that it’s devoid of the usual sappy story line which is quite common in most drama shows. The drama is not too heavy but despite being so, you will still find your tears fall such as when Anna was finally introduced to her real parents, Mr. and Mrs. Cho. The romance is also light but you will appreciate Dong Hae and Bea’s persistence to get married despite protestations from various camps. Even that of Sophia’s love for Theo, no matter how selfish it is and how much anyone will loathe it; add spice to the show. Also, you won’t wish for a fast forward button just to see how the plot turns out because every chapter is worth watching and waiting for. There is always something new you would look forward to with ever episode. With only a few more days before the local version ends, we await the fate of everyone who is part of the soap. Although I’ve only read the actual ending of the story somewhere online, I would still watch it till the end. You too can still catch Smile Dong Hae finale till the next remaining episodes.